Apple products sold like hot cakes in 2013, yet again. Tech savvy consumers lapped up 150 million iPhones, 71 million iPads and 16 million Mac laptops in 2013, generating revenues of $171 billion and profits of $387 billion. Behind these devices, there are millions of content hungry people, who wish to download more and more interesting apps to satisfy their content-hunger. And developers and content creators have not disappointed us. Recently, Apple announced that they crossed 1 million apps in their App Store, and as of now, more than 1 billion songs have been played on iTunes Radio. With 6.7 million active users, Candy Crush Saga is the most popular free app in Apple’s App Store. It overtook Farmville2 as the most popular game on Facebook last March, and continues to look solid with its delicious and addictive puzzle adventure. As of July, 2013, this game earned $633,000 every day in the US section of iOS App Store. World’s second largest search engine after Google, Youtube needs no introductions. This giant video sharing website was the second most popular app in Apple App Store for 2013. Temple Run 2 was the third most popular free application inside Apple App Store. This popular game broke several records on it’s launch, and continues to attract new gamers and enthusiasts. Vine is a new app by Twitter wherein you creates short 6-second looping videos, by combining different images and sharing them with your friends. This is quickly become very popular especially among teenagers. The inclusion of Google Maps iOS app for iPhone is surprising, as Apple has its own Maps apps. But due to Apple Map’s inability to project accurate maps, Google Maps is now the 5th most popular free apps in Apple App Store. Snapchat has quickly captured the 6th position in the most popular free app chart of Apple App Store. This chat application has a unique feature: the images, videos, text and data shared will be deleted after a particular time. Instagram has lost few positions compared to last year, but its still the most popular free app for photo editing on Apple App Store. It’s ranked 7th this year in overall ranking. World’s biggest social network is placed as 8th most popular free apps in Apple App Store. It’s popularity is decreasing as teenagers have decided to go out of Facebook. Pandora is a popular comedy and music-streaming service, which has become 9th most popular free app in Apple App Store. This sequel to the popular running app Despicable Me is the 10th most popular free app in Apple App Store. The minions need to impress Gru, and the fight is becoming tougher. Minecraft was created by Markus “Notch” Persson and later developed and published by Mojang and was first released in 2009. The game Minecraft allow players to build constructions out of textured cubes in a 3D procedurally generated world. 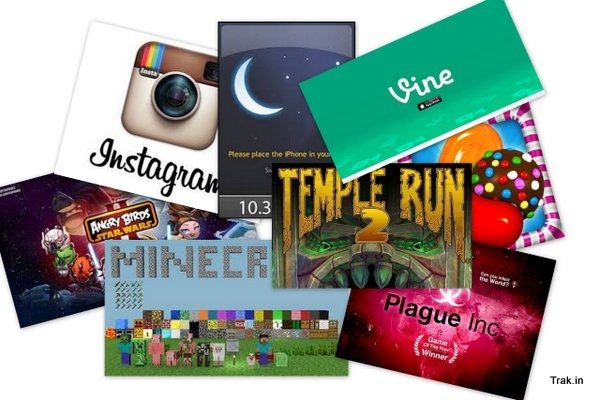 Costing $6.99, Mine Craft is the #1 paid apps in Apple App Store. Previously, it was only played on PCs and was introduced on mobile platform quite recently. Ellen DeGenere is host to a popular game show called Heads Up, which has been converted into a iOS app. This app costing 0.99 cents is the second most popular application inside Apple App Store. Temple Run Oz is the third most popular paid app inside Apple App Store. This game is set in the kingdom of Oz, the Great And Powerful. This game has also inspired a movie and there are several mini-games inside this app. This Star Wars inspired Angry Birds puzzle game has quickly climbed the charts to become the 4th most popular paid apps in Apple App Store. It has embedded several interesting features such as innovative game play elements based around science and fiction along with Star Wars inspired characters. The world is about to get infected by a deadly virus, and you need to save the world. You are in charge of the evolution and is your responsibility now. This popular game has now risen to 5th most popular paid apps in Apple App Store. Afterlight is the 6th most popular paid app in Apple App Store. This photo-editing app is equipped with several interesting features and options which can make your image look pretty and beautiful. MP3 Downloader is 7th most popular paid apps in Apple App Store. It provides several options like file manager, playlist and media library, a download manager, and a browser. You can download legal and free music into your iPhone using this application. This immensely popular tower defense game is now 8th most popular paid apps in Apple App Store. It has some interesting game elements like Monkey Lab workshop, which makes it a favorite among game lovers. This is not a simple alarm clock: it recognizes your sleep patterns, and wakes up during your lightest sleep phase, which can ensure that you feel fully rested and rejuvenated. Due to its intelligent alarm clock, Sleep Cycle Alarm Clock is 9th most popular paid apps in Apple App Store. What are your favorite iOS apps for iPhone? Please share your views here!